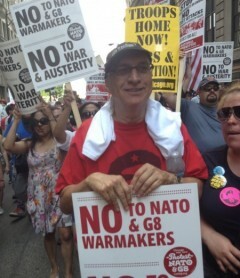 15,000 march against NATO in Chicago | Fight Back! The contingent against political repression lines up to march against NATO in Chicago. Chicago, IL - In the largest anti-war protest ever held in Chicago, 15,000 people took to the streets marching against the NATO military summit. Inside McCormick Convention Center, politicians, generals and bankers discussed the faltering U.S./NATO war and occupation in Afghanistan. They also forged agreements that set the stage for destabilizing and overthrowing independent governments in places like Syria and Iran. Outside, in the streets of Chicago’s South Loop however, waves of protesters marched in contingents with a message against NATO and G8, opposing war and poverty. Protesters were chanting and singing, surrounded by police on all sides. They were in high spirits and feeling their power, knowing their message of opposing war and poverty was reaching across the world to people suffering from NATO wars and occupations. The day began with music and poetry at Petrillo Bandshell in Grant Park, a park famous for 1960s protests against the U.S. war in Vietnam. Rebel Diaz, Tom Morello, David Rovics and hip-hop poets performed, with an appearance by the Iraq Veterans Against the War (IVAW). As the crowd began to grow, many taking shelter in the shade of nearby trees, protesters listened to speakers from scores of groups and movements that built for the protest against NATO. Hatem Abudayyeh, a Palestinian-American, who is one of 23 Midwest anti-war activists subpoenaed to a grand jury investigation and had his home raided by the FBI because of his solidarity work, also spoke: “We are organizing toward the day when Palestine will be a free and sovereign nation, with the right to return for refugees. We call for an end to U.S. aid to Israel and for people here to join us in demanding Palestinian liberation!” A big roar went up from the entire crowd. The Reverend Jesse Jackson, from Chicago’s Operation PUSH and a former presidential candidate, called for an end to spending billions on war. He demanded the money be used to fund social services and end poverty. Jackson educated the crowd about poverty in this country, often portrayed in the media as only affecting African-Americans and other oppressed peoples. Reverend Jackson said, “The largest single category of poor people is white women who are single parents with children.” Reverend Jackson used the African-American call and response tradition in his speech, much to the amazement of Occupy Wall Street activists who use a similar technique. All in all there were more than 40 speakers from students, labor, immigrant rights, war veteran, environmental, housing and healthcare groups. Speakers included Leah Bolger, the President of Vets for Peace, Larry Holmes of the International Action Center and Lisa Grab with Students for a Democratic Society. Many were interested to hear from the Afghan women for peace, and the International League of People’s Struggle representing many international movements for freedom. There were dozens of international guests who came to the protest, particularly anti-NATO organizations from European NATO countries. The importance of this is not to be underestimated, as NATO is fragile and some countries have already pulled troops out of Afghanistan. The afternoon march began with a group of Afghan women for peace joined by a large contingent of Iraq and Afghan war veterans marching together. The Coalition Against NATO and G8 (CANG8), the organizers of the march, held the lead banner, with the United National Antiwar Coalition F(UNAC) as a part of that. A river of protesters stretched across four lanes of traffic and for nearly a mile on Michigan Avenue. Onlookers and whole families came out on apartment balconies and onto sidewalks to film and take photos. Other veterans gave impassioned speeches against wars for oil and U.S. imperialism, denouncing the 1% and the U.S. government, while throwing their combat service awards and other medals as far as possible down the street towards the NATO summit. 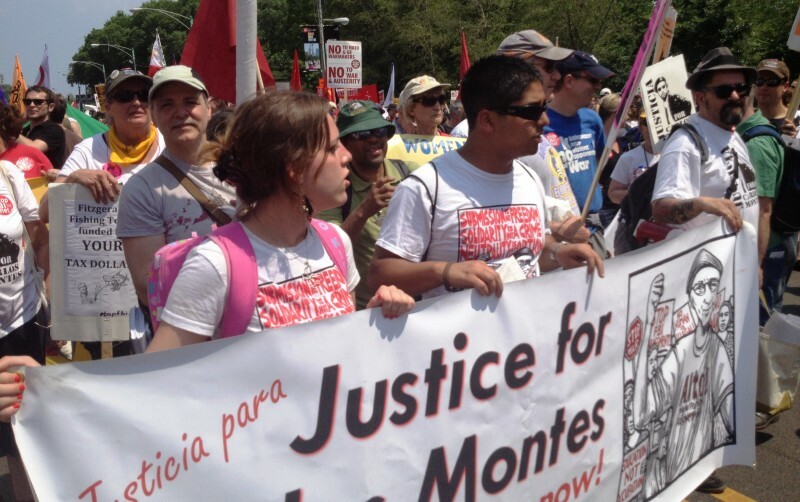 Jacob Flom of IVAW dedicated his medals to Carlos Montes and the Anti-War 23. The Iraq Veterans Against the War (IVAW) ended the day with an announcement for people to exit to the west, taking note that there was a tremendous build-up of police in riot gear and military-type uniforms. The official show of force was intimidating to people and clearly planned and funded months ahead of time. The crowds of protesters were so large, however, that it appeared impossible for everyone to exit in time for the end of the permitted Veterans rally. It soon became a scene of police encircling and pushing and shoving a much smaller crowd of people, some who responded in kind and were beaten and arrested. Others were simply singled out for arrest or beaten at random, including a few journalists. The big business media took up this story and these images to attempt to quickly bury the largest and most successful anti-war protest ever held in the city of Chicago.